Watch 40 Years of David Lynch's new book trailer premiere! Volume I will be released on April 25th and Volume II on May 16th. Enjoy the Lynchian audio/visual goodness! Join filmmaker and author Michael Adam Warren on a journey of discovery through the cinematic dreamscapes of David Lynch. 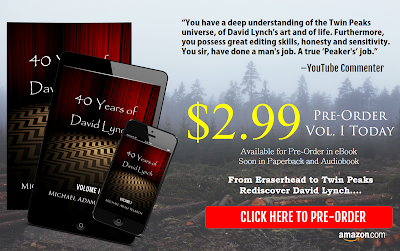 Pre-Order 40 Years of David Lynch and get Lynchian today!